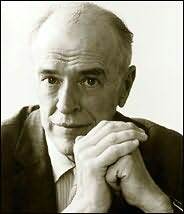 Maxwell published many of Warner’s stories in The New Yorker. By 2002 I’d read a few of her novels, most notably the brilliant Lolly Willowes and strange, magnificent Summer Will Show, and some of her stories. I’d long been looking for the book that Joanna Russ adored and talked about often, The Corner That Held Them, and hadn’t yet found it. (I eventually spotted it in Powell’s and acquired it—but now realize that I never got around to reading it, which obviously I’ve got to do.) 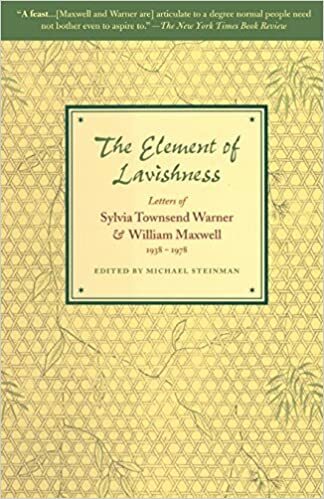 Reading the letters, I found her odd (to me) life and her sharp insights interesting, as I did her and Maxwell’s discussion of writing process. But I skimmed past editorial conversations. I hope that it is true that in the matter of your stories I am just a little unique, but in the matter of “Johnnie Brewer” I suspect were all a little unique. I will begin with myself. I took this sentence for the clue to the story: “England also contained castles, cathedrals, an unknown number of the oldest yew trees in England Devil’s Dykes, Devil’s Beef tubs, Stonehenge, and his grandmother.” Your lists are never haphazard, and I took this story to be a distant cousin to Lolly Willowes, or a grandnephew. As I read it, the hero, who comes from a new and fairly raw civilization and is therefore naturally attracted to everything that is old in the country of his mother’s birth, is, in spite of or perhaps because of an almost American ingenuousness, given a taste of what lies at the heart of a civilization or a person who has reached a very great age—not evil as it is commonly thought of in the contemporary world but a much older, livelier, and more hair-raising thing altogether—something (as the Puritans used to say) abominable. All this against the background of the most ravishing descriptions of the English countryside that have ever been, or ever will be, written—something else that is only possible in a place of great age. Number 2: Mr. [Robert] Henderson took it to be a story about a young Australian who went to visit his English grandmother and while he was there, in the middle of the night, he had an experience so horrifying that Mr. Henderson doesn’t expect ever to forget it. Number 3: Mr. Shawn read it as the story of two old ladies who are competing with each other for the boy’s affection, both wanting to mother him, and jealous of each other’s attentions to him, but thinks that the scene in the middle of the night needs to be toned down a bit. Though I am conveying this suggestion to you (and you must of course feel perfectly free to act on it, if it appeals to you) my heart isn’t in it. I think he read the story too hurriedly and doesn’t understand what it is really about. It is successful as it stands—though horrifying (and meant to be)—and would not be successful if you toned down (that is to say did away with the conscious sexual intention) the scene in the middle of the night, because that is the story. But it is not a story that can be printed in The New Yorker. I will hold the manuscript until I hear from you. PS I neglected to say that if we are all three wrong, or if I am wrong, it is most important that you set us straight. So, three editorial readings, three different stories (so to speak). Reminds one a bit of workshop readings, doesn’t it? But the key, of course, for the purposes of editing, is figuring out—and in this case, asking the author— what the story she wishes to tell is. That will determine (a) whether the story needs more work and (b) whether it’s suitable for the venue the editor is serving. I’ll admit that I’m tickled by the idea of this story being the “grandnephew” of that superb novel, Lolly Willowes. (I don’t think it’s ever occurred to me to characterize an author’s works in terms of familial relations.) What particularly appeals to me in Maxwell’s side of the conversation is the way in which his preferred reading isn’t one that is compatible with the magazine he’s reading for—but that he’s open to a different reading, albeit one that will require a rewrite, depending on the author’s own wishes for the story. “You were nearest right, because you saw the old women were part of the landscape; Mr. Shawn was on a right line, for their competition and jealousy is what unlocks their sexual excitement. But I have misled you all, because none of you have seen that both of them are withering with boredom in their ravishing surroundings, and that why they talked about the hard winter was that it was something positive to talk about, the only interesting thing that had happened for years. I thought (but wrongly) that the quotation from Virgil, far from haphazard, and needing a careful grafting in to the story, would be pointer enough to why they seized on the novelty, the gobbet, or fresh young Johnnie. And another thing I now wonder if I established enough is Johnnie’s blithe and heartless egotism. Did you feel, when he drove on into Wales, that any scar, any dint, would remain on him? I didn't. He drove all day, and spent the night at St. David’s with never a thought of the night at Bodkins because in the morning he would see the cathedral properly by daylight. So I think a little later on I would like the story back, to see if I can readjust the values. At the moment, obviously the scene in the middle of the night is far too assertive; toning it down and toning up the boredom of ergo tua rura manebunt [“Thy lands are yet thine own,” Virgil] might fix it. I should like to fix it; because lately I have got into a bad way of always having a reflective or analytic character somewhere about, a sort of Stockmar who exists in order to save me the trouble of making statements that can stand without being annotated. True, I am cunning enough to make my Stockmars rush to wrong conclusions—but a wrong conclusion is only a signpost to the right one. No! Down with Uncles! So: seeing that some of her subtlety (“pointer enough”) was too subtle for even as acute a reader as Maxwell (not to mention his assistants), Warner began to wonder if other things might need “toning up” as well. I’m reading her reply as assuming that it is a “New Yorker story.” Since she has by this point sold numerous stories to that magazine, likely she had a sound sense of what kind of stories they would take and what kind of stories they wouldn’t. The story doesn’t come up again in the volume of letters, but it was in fact published in The New Yorker in April 1965, a little more than a year later. This exchange, I imagine, offers us a fine example of what editorial conversation between a first-rate editor and a first-rate writer looks like. Timmi, I know this is at a tangent to the editor/writer conversation, but if you're a fan of Warner, you might be interested in the forthcoming (end of March) The Akeing Heart: Letters between Sylvia Townsend Warner, Valentine Ackland and Elizabeth Wade White, by Peter Haring Judd. Thank you, Nicola! I didn't know, & I'm definitely interested.